A cow is tethered at the point to a black building of semiperimeter . The figure represents half of the area it can graze with a leash equal to . Change the angle to see what happens as the cow moves around the building. The shape of the base of the building can be either a regular polygon or a circle. If you choose a polygon, use the slider to increase the number of sides. The tether problem is a classic problem from grade school mathematics. A cow is tied to a rectangular building with a leash of fixed length. For given dimensions of the rectangle and length of leash, the student must determine the area of the region the cow is free to graze. The solution involves sectors of circles whose radii depend on where the leash wraps around the corner of the building. If the building is a silo (i.e. a cylinder), the problem is more difficult. The boundary of the region includes a portion of the involute of a circle, and the area can be determined using multivariate calculus . 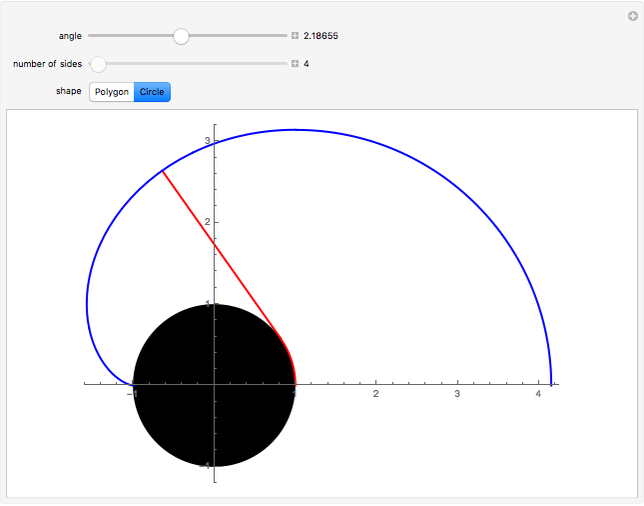 In this Demonstration (inspired by Archimedes's approximation of using regular polygons with more and more sides), we show how the elementary approach involving sectors can be extended to the circle case. Suppose the base of the building is a regular -gon with semiperimeter and that the length of the leash is also . Focusing on the top half of the polygon and starting opposite to where the leash is tethered, going clockwise, let the vertices be , where . 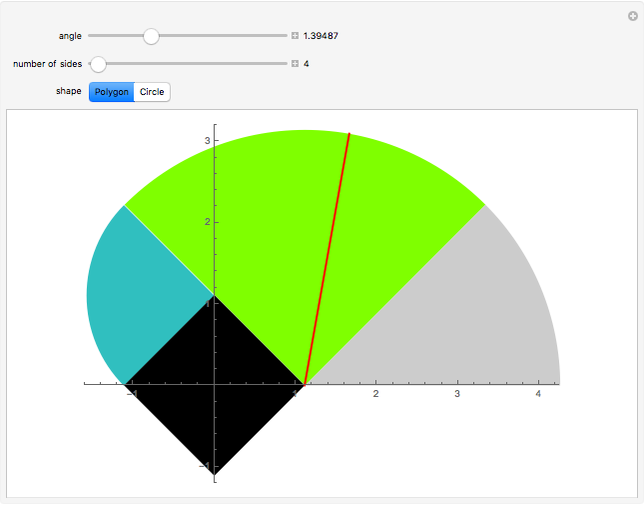 For , the area of the colored sector at depends on the measure of the external angle and the radius at that vertex ; . The sum of the areas of the colored sectors is as . The area of the gray sector is as . As , the area of the sectors converges to . By symmetry, the total area the cow is free to roam is twice this, or . D Roy, "The Involute of a Circle," UniversalPhysics.info (blog). (Feb 2, 2012) www.universalphysics.info/the-involute-of-a-circle. Eugene Curtin and Alexander White "From the Tether Problem to the Involute of a Circle"